This is one of the best known forms of cooperatives. They are owned and controlled by the people that buy the products and services sold, managed or distributed by the co-ops. Their mandate is to acquire the products and services required by their members at the lowest possible cost with the highest possible quality. These co-ops can operate in three different ways; as buying clubs where products and services are obtained by the co-op only when the members place an order; as retail stores where the members come in to shop; and as service providers where members order the service, such as cable television, internet access, insurance, water or natural gas. In Manitoba there are general stores, gas bars, farm supplies, furniture stores, funeral services, natural gas utilities, water utilities, internet access and cable television co-ops serving the needs of their members. 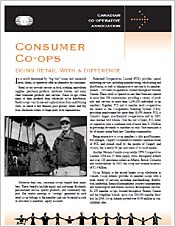 For more information please read about Consumer Cooperatives (PDF).